The Kensington is comprised of four Victorian townhouses, giving it an air of old-world grandeur. From the stucco facade to the Drawing Room and the White Room, you’ll be surrounded by classic British elegance. All of the rooms and suites are fittingly opulent. The drapes, lavish headboards and oversized beds are very satisfying. As are the aromatherapy amenities in the bathrooms. High ceilings, columned balconies and entry-ways are blended effortlessly with the modern design and decor. The food is also very good. You can dine on classic British cuisine such as beef wellington, fish and chips and afternoon high tea. The classic rooms at The Kensington are elegantly furnished. Luxury fabrics, chenille throws and extremely comfortable beds are sure to satisfy. King, Queen and twin bed options available. Expect classic, understated British design. The grandiose headboards, antique bedside tables and vintage wallpaper make every part of the room a statement. Featuring a four-poster bed and a free-standing Victorian roll-top bath, this suite has a regal feel. The centrepiece is a Waterford crystal chandelier – you could imagine Liz Taylor staying her. A step above the rest, the Knightsbridge Suite offers a standard of elegance that few hotels can match. Featuring a large bedroom, a living room, two bathrooms, a dressing room and a balcony overlooking the city, you will hardly be short of space. The hotel’s Victorian style is continued with two decorative fireplaces and floor-to-ceiling windows. The Kensington Suite combines the Knightsbridge Suite and Brompton Suite, creating a generous three bedroom apartment. With two separate living rooms and balconies, this a regal setting in the heart of London. 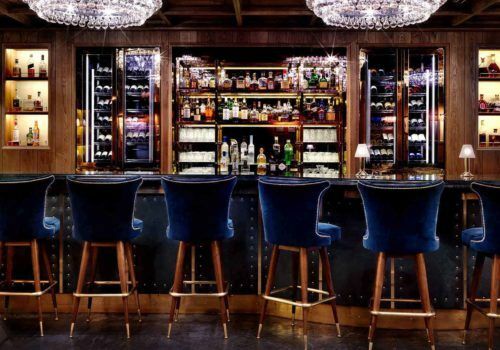 A discreet yet elegant cocktail bar that calls to mind the world of Mad Men. With both classic and contemporary cocktails as well as an extensive wine list. Recently remodelled, this restaurant provides an exquisite dining experience centred around classic British cuisine. With an upscale yet relaxed atmosphere, this is one of the perfect locations for any meal of the day – including the fabulous afternoon tea. The Townhouse restaurant also offers a hand-picked wine list.